We did not have much time this morning to pack lunches. To be exact: we had 20 min. 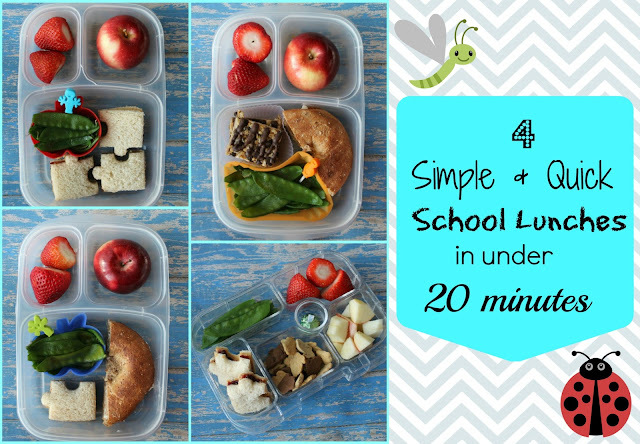 And I wanted to show you that even with only 20 min I was able to pack 4 healthy and fun school lunches and get us all out the door. Lunch for my second grader is packed in his Easylunchbox and contains a mini apple, some strawberries, a puzzle shaped peanut butter sandwich and steamed snow peas. He also packed a yogurt and ice water. My fifth grader packed a mini apple and strawberries as well, a half a whole grain bagel with cream cheese, steamed snow peas and a small puzzle peanut butter sandwich. He also packed yogurt and ice water and two snacks since he has a long day today. My first grader is bringing a mini apple and strawberries, a half a whole grain cream cheese bagel, a cereal bar and steamed snow peas. He also packed ice water. 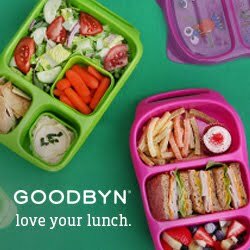 I also packed our yumbox for my 4 year old daughter since we had a doctor's appointment that was further away today. I packed her steamed snow peas, two puzzle peanut butter sandwiches, Annie's bunny cookies, apples, a Hershey kiss and also some strawberries. Great lunches! I really need to be more creative and do something like this! Stopping by from Pin Me :), I'm your newest follower. Wow looks great and amazing its all packed so fast! Love the little picks too! Great lunches! I'm always looking for quick recipes, Thank you for sharing. Lovely lunches! Thank you for linking to 15 Minute Fridays. I love how these are all different...but the same! Love these! So tasty looking :D Thanks for linking up to Meatless Monday!